Appalachian Mountain Roots: Reckon Heaven Will Have Tomato Sandwiches? Reckon Heaven Will Have Tomato Sandwiches? My local produce stand opened this week! I was so excited. They posted a picture over on Facebook and they had some of the prettiest tomatoes which upped my excitement. I immediately started craving a tomato sandwich. If there had to be a perfect Appalachian sandwich, it would be the tomato sandwich. Anywhere for that matter! Since it's too early to have any homegrown tomatoes and since I refuse to make a sandwich out of what our local grocery stores try to pass off as tomatoes (they have no taste! ), the produce stand is the next best place to get them. Now I firmly believe you need to have three essential items (not counting salt and pepper) to make the perfect mater sandwich. Real tomatoes. If they're not homegrown, get them from a local produce stand or farmer's market. Mayonnaise. I'm going to be honest, I was never a fan of the stuff until about 2 years ago. I mean I would eat it if it was on a sandwich or burger that I had ordered but I never added it to my homemade sandwiches. 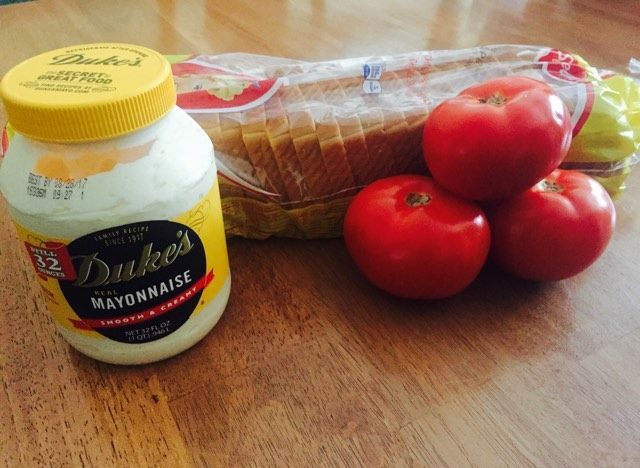 That was until I finally decided to see what the fuss about Duke's mayo was all about. GLORY! It was life changing. I can't make a sandwich without it now. Mayo is a very touchy subject in the south. I won't tell you what kind to buy but I will highly recommend Duke's. It was life changing! FRESH white bread, also known as light bread in these parts. I understand that society is shoving the "white bread is the worst and has no good nutritional value" stuff down our throats but I don't care. 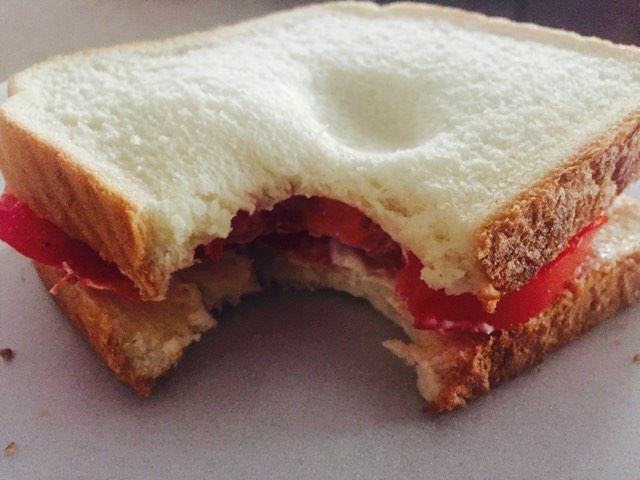 If you're going to make a good tomato sandwich, it has to be with white bread. And it needs to be FRESH. I'm talking "stick to the roof of your mouth without even having anything on it" fresh. You know what I'm talking about! My favorite brands are Kern's, Sunbeam, and Bunny bread (in no particular order). I had just bought a loaf of Sunbeam so that's what I used. I like to spread mayo on both slices of bread, add some fairly thick slices of tomato, salt, and a lot of fresh ground black pepper. See that thumbprint I left in the bread? FRESH. As I was enjoying my sandwich, I started wondering if heaven will have tomato sandwiches. Heaven will be a perfect paradise and I can't imagine paradise without them. Do you like tomato sandwiches? How do you make yours? If you happen to be a local follower I highly recommend Peachtree Produce. Stop by and check them out!